A treatise in the Mishnah, in the Tosefta, and in both Talmudim, treating of the divineservice on the Day of Atonement, of the fasting ceremony on that day, and of other regulations pertaining to the occasion. In the Tosefta this treatise is entitled "Yom ha-Kippurim" (Day of Atonement), while in the Mishnah (ed. Lowe), as well as by Sherira Gaon, it is called simply "Kippurim" (Atonement). 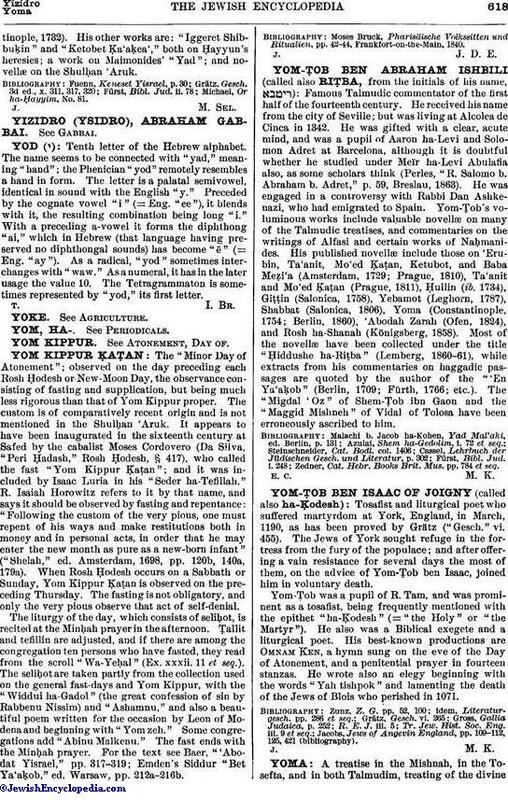 The Day of Atonement was known also as "Yoma Rabba" (The Great Day), often shortened to "Yoma" (The Day); hence this treatise was given the name of "Yoma" in the Mishnah as well as in the Talmudim. In most Mishnah editions the treatise is the fifth in the order of Mo'ed. It is divided into eight chapters, containing a total of sixty-one paragraphs. Ch. i.: On the high priest's seven days of preparation for his service on the Day of Atonement; how the stipulated order of the sacrificial ceremony was read to him, and how the elders impressed upon him that he should proceed only according to the prescribed order, and not in harmony with Sadducean customs (§§ 1-5); regarding the night of the Day of Atonement; if the high priest was a wise man and a scholar, he preached a sermon; if not, the sages present delivered a lecture or read from Holy Script, choosing only passages from the Hagiographa; how the young priests watched to see that the high priest did not fall asleep (§§ 6-7); on the removal of the ashes from the altar upon the Day of Atonement and upon other days (§ 8). Ch. ii. : In connection with the rules regarding the removal of the ashes (i. 8), it is said that this duty originally devolved on all priests without any specific allotment, such distinction being introduced only in the course of time (§§ 1-2); other allotments made in order to distribute the Temple duties among the priests (§§ 3-4); when the daily sacrifice ("tamid") was offered, and regulations concerning other sacrifices (§§ 5-7). Ch. iii. : Further regulations regarding the divine service in the Temple on the Day of Atonement; how the high priest was to bathe five times and wash himself ten times on that day; regarding the various dresses he should wear for the different services (§§ 1-7); the presentation to the high priest of a bullock, and the confession of sin he was to speak while holding his hands on the bullock's head (§ 8); the casting of lots for the two he-goats; Ben Gamla had made two golden dice for this purpose, and was therefore mentioned with words of praise (§ 9), as were also Ben Ḳaṭṭina, King Monobaz, Queen Helene, and Nicanor, who had all introduced improvements or embellishments in the sanctuary (§ 10); words of blame directed against the family of Garmu for being unwilling to teach others how to prepare the showbread; similar comment on the family of Abtinas for refusing to teach the method of compounding the incense ("ḳeṭoret"), and on Hugros (or Hugdos) ben Levi and Ben Ḳamẓar, who refused to give instruction in singing and writing respectively (§ 11). Ch. iv. : How lots were cast by the high priest over the two he-goats, one of which was slaughtered, while the other was sent to Azazel; how the high priest marked the he-goats by placing a red ribbon upon the head of one and around the neck of the other; the confession of sin pronounced by the high priest for the priestly caste (§§ 1-2); particulars of the incense-offering on the Day of Atonement; the ascension of the high priest to the altar, and his washing of hands and feet (§§ 3-6). Ch. v.: What was done in the sanctuary; the incense-offering; the sprinkling of the blood, first of the bullock, and later of the he-goat; the short prayer spoken by the high priest; the foundation-stone ("eben shetiyah") in the most holy part of the Temple, upon which the high priest, in the absence of the Ark of the Covenant from the Second Temple, placed the incense; the purification of the golden altar; and other regulations regarding the order of service on the Day of Atonement. Ch. vi. : What was done with the he-goat sent to Azazel; the confession of sin pronounced by the high priest for all Israel while he held his hands upon the head of the Azazel goat; who might lead the animal to Azazel (§§ 1-3); how the Babylonians present in Jerusalem used to pluck hair from Azazel's goat; how the aristocratic Jerusalemites accompanied the goat to the first halting-place; regarding the ten stations in the journey from Jerusalem to the mountain-top from which the animal was thrown down; how it was thrown; how color-signals were used to make it known in Jerusalem and in the Temple that Azazel's goat had reached the wilderness; how to the door of the Hekal was tied a red ribbon, which turned white when the goat had arrived in the wilderness (§§ 4-8). Ch. vii. 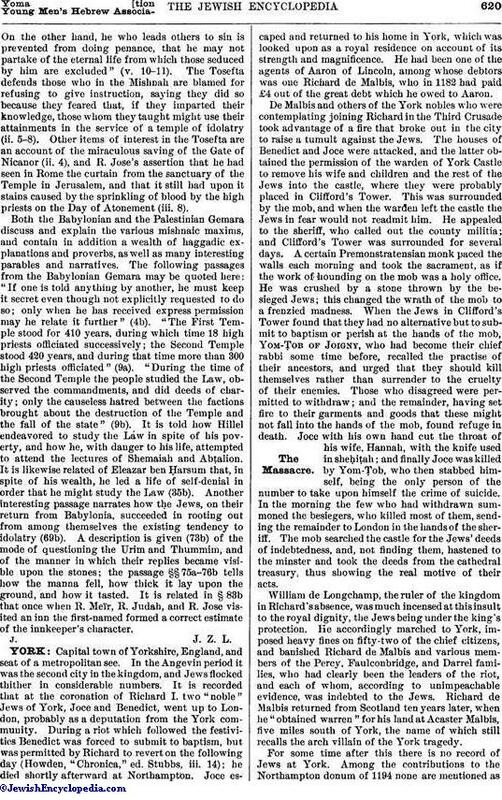 : The ceremony attending the high priest's reading from the Law; the paragraphs read by him, and what he repeated; the benediction pronounced by him, the remainder of his duties, the eight articles of dress which he had to wear when conducting the service and when questioning the Urim and Thummim; on what occasions the Urim and Thummim were consulted. Ch. viii. : Regulations concerning fasting on the Day of Atonement; from what enjoyments one must abstain; the means by which atonement is made—through sin-offering, guilt-offering, death, Day of Atonement, and penance; cases in which no atonement takes place; sins against God are expiated through the Day of Atonement, while sins against one's fellow men can be blotted out only when pardoned by those trespassed against. On the original form of this mishnaic treatise see Joseph Derenbourg, in "R. E. J." vi. 41 et seq. The Tosefta to this treatise is divided into five chapters, and contains additions to and amplifications of the Mishnah, and also several haggadic and ethical maxims, among which the following may be mentioned: "Ben 'Azzai used to say, 'What belongs to you [i.e., "What you have deserved"] is given to you; by your name [i.e., "the name you have made for yourself"] you are called; and on the place to which you are entitled you are stationed. God forgets no one; and no man can take to himself that which is intended for another'" (ii. 8). "He who induces others to lead good and pious lives will be prevented from committing any sin, in order that he may not be excluded from the future world while those taught by him partake therein.On the other hand, he who leads others to sin is prevented from doing penance, that he may not partake of the eternal life from which those seduced by him are excluded" (v. 10-11). The Tosefta defends those who in the Mishnah are blamed for refusing to give instruction, saying they did so because they feared that, if they imparted their knowledge, those whom they taught might use their attainments in the service of a temple of idolatry (ii. 5-8). Other items of interest in the Tosefta are an account of the miraculous saving of the Gate of Nicanor (ii. 4), and R. Jose's assertion that he had seen in Rome the curtain from the sanctuary of the Temple in Jerusalem, and that it still had upon it stains caused by the sprinkling of blood by the high priests on the Day of Atonement (iii. 8). Both the Babylonian and the Palestinian Gemara discuss and explain the various mishnaic maxims, and contain in addition a wealth of haggadic explanations and proverbs, as well as many interesting parables and narratives. The following passages from the Babylonian Gemara may be quoted here: "If one is told anything by another, he must keep it secret even though not explicitly requested to do so; only when he has received express permission may he relate it further" (4b). 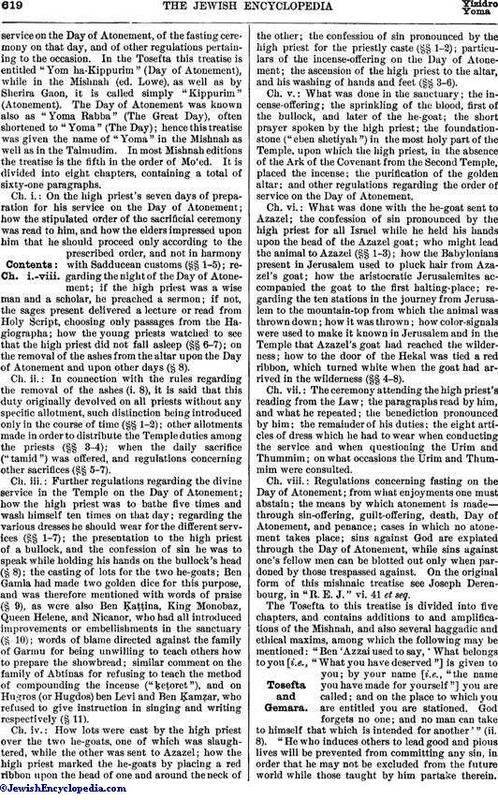 "The First Temple stood for 410 years, during which time 18 high priests officiated successively; the Second Temple stood 420 years, and during that time more than 300 high priests officiated" (9a). "During the time of the Second Temple the people studied the Law, observed the commandments, and did deeds of charity; only the causeless hatred between the factions brought about the destruction of the Temple and the fall of the state" (9b). It is told how Hillel endeavored to study the Law in spite of his poverty, and how he, with danger to his life, attempted to attend the lectures of Shemaiah and Abṭalion. It is likewise related of Eleazar ben Ḥarsum that, in spite of his wealth, he led a life of self-denial in order that he might study the Law (35b). Another interesting passage narrates how the Jews, on their return from Babylonia, succeeded in rooting out from among themselves the existing tendency to idolatry (69b). A description is given (73b) of the mode of questioning the Urim and Thummim, and of the manner in which their replies became visible upon the stones; the passage §§ 75a-76b tells how the manna fell, how thick it lay upon the ground, and how it tasted. It is related in § 83b that once when R. Meïr, R. Judah, and R. Jose visited an inn the first-named formed a correct estimate of the innkeeper's character.